On my mark. Get set. Here we go. Joe, my first J-school friend at Mizzou (we met during Summer Welcome, attended a Maneater meeting together before classes started), has lent his Washington expertise to coordinate my arrival and swift getaway. I’m flying out of BWI at his recommendation. I am outfitted with train schedules because of him. And I had a ride from the airport tonight because of him. This gave us a few hours to catch up, and — because it’s Martin Luther King Day — visit the MLK memorial for the first time for each of us. (A picture from the memorial.) As we meandered from there, through the FDR memorial and on to the Jefferson Memorial, Joe debriefed me on college friends, on his latest stories (the Keystone XL pipeline), and on his eight weeks in Afghanistan as an embedded journalist. We throw this word around a lot now in journalism: embed. Writers are “embedded” with different political campaigns. Reporters advertised themselves as “embedded” with Occupy Wall Street. Heck, I’ve had “embedded” assignments before. When I rode in the World Series championship parade on David Freese’s float, it was referred to at one point by a colleague as “being embedded.” Tomorrow, at Walter Reed, I’ve been told I’ll be “embedded” with one of the groups players that is touring the facility and meeting with patients. The use of the word should not imply that any of us know the meaning of the word. As part of a project for The Omaha World-Herald — described here in the paper’s At War, At Home blog intro and the gripping entries that followed, including the top one by Schukar that includes more pictures — Joe went to Afghanistan to embed with a National Guard squadron from Nebraska and Iowa. Like so many of our friends, I checked Facebook and Omaha.com constantly to make sure of his well being. I couldn’t tell him enough upon his return how proud I was to call him a classmate and friend. Over dinner, he told me about the intricacies of traveling to Afghanistan. Over a few pints, we talked about how he outlined the stories he’d attempt to do, and how many stories he had to juggle and report at one time. I was fascinated by the, ahem, inside-baseball details of coverage in a war zone. What did he wear? What kind of insurance did he have to have? How did he get from place to place? Did he keep a diary? How many reporter notebooks did he pack for the trip? The answer: eight. Or, “not enough,” Joe said. And so on … Was he in a firefight? BAGRAM AIR FIELD, Afghanistan — The bad guys had escaped once again. At least, that’s the way it looked Thursday afternoon to the Iowa Guardsmen scouring a series of ravines for more than an hour without finding two suspected insurgents they had seen earlier toting AK-47s. Then, suddenly, Spc. Mark Otte of Atlantic, Iowa, saw them, about 40 feet below him on the floor of a ravine. Otte stared into one man’s face and pointed his gun at him, waiting to see whether he would surrender. Instead, the man opened fire with his assault rifle, forcing Otte back from the edge of the ravine. About the same time, other soldiers from Bravo Troop who were searching the ravine floor came upon the men. The man shooting at Otte quickly redirected his fire at the soldiers in the ravine. Staff Sgt. Michael Davis of Altoona, Iowa, was the closest — less than 10 feet away. Davis stumbled backwards from the oncoming bullets and got tangled with Spc. Jeremy Henrich of Hinton, Iowa. They fell over, returning fire as they went down. They rolled over and kept firing. Henrich positioned his rifle on top of Davis’ helmet to make sure he didn’t accidentally shoot his buddy in the tight space. The firefight ended with the swift and permanent assist from two helicopters — video of which Joe showed me after we had DVR’d our way through tonight’s Mizzou game. The photo above comes from after the firefight as the convoy resumes. Reading the newspaper story online that came from what Joe just told me, I’m struck by two things. One, the description of the close-quarters conditions that the servicemen confronted that day: “the gunfire was thick, the ravine narrow,” Joe wrote. Two, that despite all the dust and bullets and weapons cache that the only participants injured were the two enemy fighters. Both were killed in the helicopter strikes. So much of what Joe told me about his eight weeks in Afghanistan will help me at Walter Reed, and hopefully make my questions less naive, more respectfully. Above all else, let me be respectful. “We’re lucky to be alive,” one of the servicemen told Joe. When I hear a quote like that, I know how to use it. When an embedded journalist like Joe hears a quote like that, he knows what it means. It’s like the photo above. From the comfort of our laptops or our couches, we all can see the imposing nature of the terrain. We can only guess what it means. 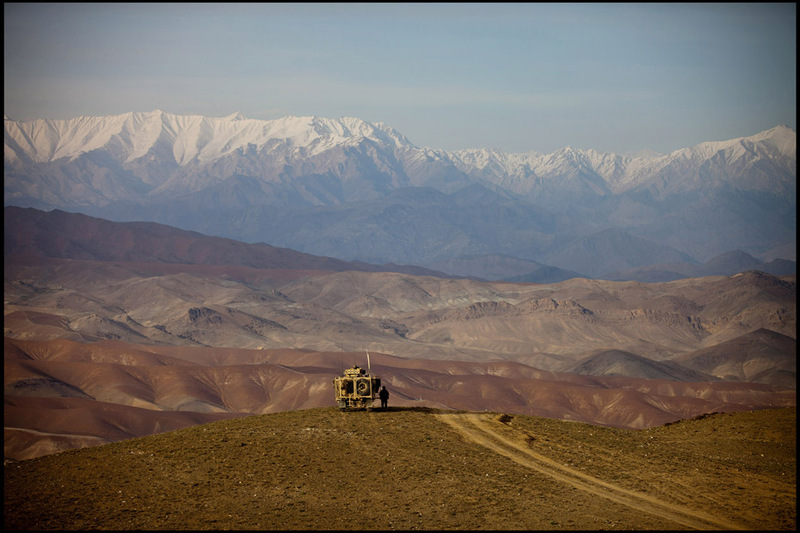 This entry was posted in journal, journalism, newspapers, project 365+, travel and tagged afghanistan, joseph morton, mizzou, omaha world-herald, walter reed, white house by dgoold. Bookmark the permalink.